Ramah in the Rockies seeks to be an environmentally responsible camp in all its programs and construction. As they continue to develop their physical plant, they face ongoing challenges of how to minimize their carbon footprint and build environmentally sustainable buildings. They chronicle their energy use in all aspects of their program. One area that uses a substantial amount of energy is the shower-house, where water must be heated to a temperature of 104 degrees to allow for adequate hot water during showers. A key challenge in running a Jewish, Sabbath-observant camp, is enabling all members of the community to shower (preferably with hot water) in a short period on Friday afternoon. In the summer of 2012, they used an average of 1500 gallons of hot water each Friday in a 3-hour period (compared to less than 200 gallons in any other period). They needed to develop a system that would allow for a high amount of hot water during a discreet peak time each week, while not wasting energy maintaining hot water in a dormant stage for the majority of the week. 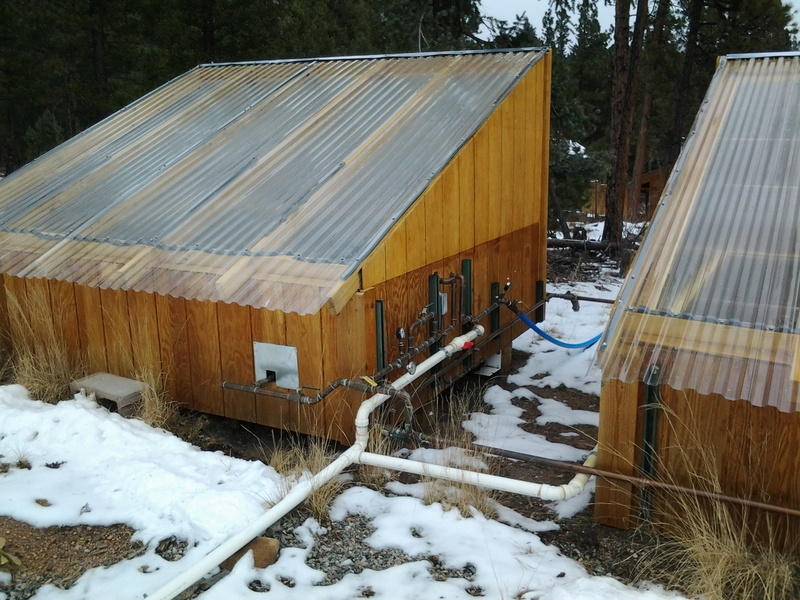 In the summer of 2012, Ramah in the Rockies developed an experimental solar water heating system, based on an innovative concept not found in other systems operating at this scale. First, they conducted an exhaustive review of traditional hot water systems, where they discovered that a traditional system needed to provide their peak capacity would cost tens of thousands of dollars to install and many thousands in energy costs each year. With some creative thinking, collaborative tinkering and experimentation, they created a system that would raise the ground temperature of the water enough so that it would require little or no extra heating. 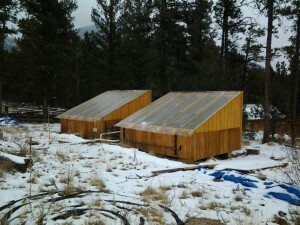 This system employed solar heating. They added a tankless water heater to further raise the temperature as well as a fan and cold water input in case they needed to lower the water temperature. 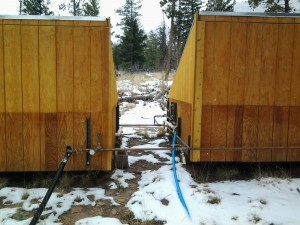 This self-contained system uses two commercial grade 500-gallon drinking-water bladders and a hot box. The black bladders, similar to those used by the military to delivery large quantities of water to military zones, absorb the sun’s rays and heat the water inside. They then built a large containment box to enclose and protect each bladder plus the plumbing connections. Each box was covered with solar film to protect the bladders from rain and allow adequate sunlight to pass through. The covering also traps the heat generated in the box. The box was lined with reflective insulation to reflect sunlight to further heat the bladder and retain heat. They added numerous valves and components to the pipes to allow for pressure to be released as the water heats up, and to maintain a steady flow from the box to the shower house. Importantly, they placed the box uphill of the shower house, but downhill from the main camp water tanks, hoping to feed the hot water to the shower house using only gravity and eliminating the need for electricity in the system. However, after the system became operational, they had to install a small energy-efficient pump to increase the water pressure in the shower house. The initial system successfully raised the water temperature from 45 degrees (well water temperature) to 85 degrees on most days. Two energy efficient tankless water heaters were also added to boost the temperature on-demand if needed. This system allowed all their campers to take hot showers on Friday afternoon and reduce their energy costs significantly compared to more traditional systems. 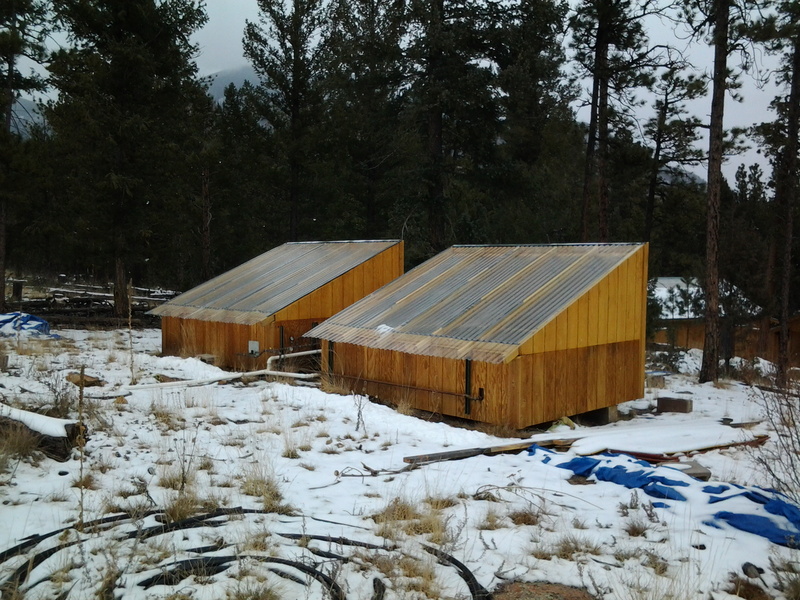 With help from the Gendler Grapevine Project, in the summer of 2013, Ramah in the Rockies redesigned the solar boxes by building a roof at a 24-degree angle to allow for better sunlight penetration and adding energy efficient polycarbonate panels to absorb the sun’s heat and repel rain. This optimized the operation to ensure reliable operation. At times, the modification raised the hot water temperature to over 90 degrees, warm enough for most showers, and resulted in less need for supplemental heating from the tankless hot water system, thereby using even less energy. During the summer, they added signage around the boxes, including descriptions of the water tanks near the shower house for all the campers to read. When taking campers and donors on tours of the camp, they often stop at the boxes to explain how this project has enabled them to further their camp mission and reduce their energy footprint. (Visit Ramah in the Rockies’ website to learn about their green initiatives.) These boxes, coupled with the Plexiglas roof on the new bathhouse, are two of the most energy efficient, most replicable, and least expensive ways to reduce their carbon footprint without installing traditional solar panels. While they had intended to create a similar system in a small new shower house for 2013, given the lack of slope nearby (to allow for the pressure to work), and the cost of installing this unit, they opted instead for a much smaller tankless propane hot water heater that used no electricity when on standby. Once water flows, the water actually turns a turbine inside the system, generating a small amount of electricity to ignite the propane heater. This unit cost $750 plus installation. While not as “innovative” as originally planned, it still allowed them to provide hot water for their staff members living in this distant part of the ranch without electricity. Also, given the limited use of this shower house, this highly energy-efficient heating system used very little propane and no electricity over the course of the summer, with no wasted energy. * While the long-term savings are great, start-up costs can be significant and will likely require fundraising from external sources. Conducting thorough analysis of your site and water needs will help ensure that the money spent will result in the best system to meet your needs. * Ensure that there is adequate pressure in the system and if possible use gravity to allow for increased pressure. * Solar water heating is unpredictable due to temperature and clouds; have both an energy-efficient backup and booster systems as well as a sufficient plumbing configuration to help consistently regulate temperature. * It’s important to note that for some applications, a more traditional tankless unit, like the one Ramah uses in the staff shower house, may meet your needs more readily, with limited environmental impact and at less cost than the solar bag system. In other words, these solar bags are terrific when there is a huge demand for hot water in a limited amount of time, but they aren’t the most efficient when there is a small demand for water over a more regular period of time. * Finally, Ramah in the Rockies encourages others to think outside the box. Success with a creative and innovative project will give you confidence to try other new projects.